Feel confident in your readings! This Deluxe Hydrometer is perfect for the serious homebrewer who knows how important the right numbers are to making good beer. 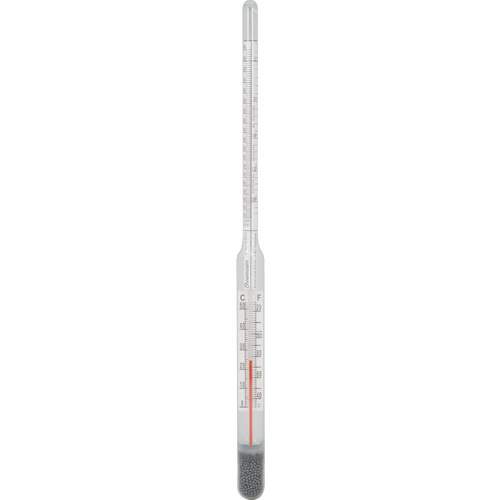 This deluxe hydrometer for beer features a built-in thermometer with correction scale that allows you to instantly correct your hydrometer readings for temperature. All hydrometers are calibrated to read correctly at a particular temperature, and temperatures above or below that point require that you add or subtract from your reading. Like the basic model, this deluxe hydrometer also features three scales - Specific Gravity, Potential Alcohol and Brix (Balling). I wanted to have a spare just in case. Because I knocked mine off onto the hardwood floor, lol. But seriously I liked the integrated thermometer. I've always used a meat thermometer with a dial and I always questioned the accuracy. I separately tonight bought a Thermoworks RT610B-24 digital probe, I am covering it with all angles with the built in thermo on this hydrometer. I am making mead and need to check potency. Consistently measure the results of my labor. BEST ANSWER: Hello Chris - The length is 11.25". Worked perfectly the first time I used it. Order was fast and item is exactly what I needed. I was still using the hydrometer that came with my kit for the last year, I had recently bought the finishing hydrometer and noticed the quality of it, and I have to say having both hydrometers has added a level of accuracy to my notes. I can defiantly see the difference in the quality over the one that came with my kit. Having a readable temperature gauge built into the unit is a nice addition. I no longer have to use my temp pen to perform a correction factor for my sample it?s on the hydrometer. Do yourself a favor and buy this and the finishing hydrometer and feel confident with your readings. Great Hydrometer. Worth the extra money. very accurate! 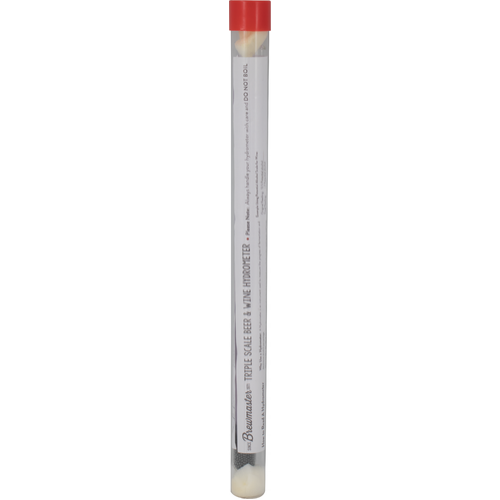 The built in thermometer makes this hydrometer very useful in getting precise readings! I bought this as a replacement for a 20 year old one that my son dropped and broke. I was looking for one with temp adjust scale and easy to read numbers (proper beer scale). This has both. Great for recording gravities and helping you make better beer. But be very careful, this glass is the farthest thing from strong. Broken from a tip over in hydrometer. Upgraded to a refractometer, and that was a great upgrade especially since it uses less beer for readings. Who hasn't broken one of these? This was my first hydrometer, and I really loved it right up until I dropped it :-(. It makes taking samples much easier as you can get the temp and the S.G. in one shot. Often homebrewers just read the numbers and forget to cross reference for temp adjustment. This all in one tool helps the lazy brewer in all of us to ensure an accurate reading. If you really care about the numbers get this! Shows the temp adjustment right on the hydrometer. Accurate, great tool. A must-have. Easy to read, accurate. Gets the job done. Not as fragile as I would have thought. I am not very happy with this hydrometer. For some reason the temperature gauge is all blue so it does not give me the correction factor anymore. If I were you I would save your money and just by a standard hydrometer. Love the thermometer in the hyrdrometer, allows for temp adjustments and just to double check fermenting temps. Neat idea, best hydrometer I have. I didn't want to spend much on this. It gives me an accurate reading and seems as though it is all I needed. This is great on taking the guess work out of the correction for temperture for gravity readings. As with 99% of hydrometers out there, they are a bit fragile so treat with care. Never have to use a thermometer and a hyrometer again. Cuz both measurements are in one place! Accurate hydrometer and temp scale is helpful. I have two of these - stored one in the garage over the winter and the temp scale no longer works. Requires about 150 cc of wort (depending on gravity). I broke my first hydrometer. Initially despondent, this event turned out to be a godsend. I bought this deluxe hydrometer and am very pleased with it's accurate function and built in thermometer. When I'm not brewing I use it to monitor temperature of my beer as it goes through the conditioning process. temperature correction makes this a more idiot proof device for beginners as well. This hydrometer was fantastic. Read really well, balanced well, and the temperature correction was great to have. I'm writing in the past tense because... I put this in wort that was too hot and it shot the temperature calibration liquid up and it never came back down. It still works as a hydrometer, but the temperature correction part it blown. Very sad.